One of Eastern Canada’s most respected businesspeople and philanthropists, Victor L. Young has held high-level positions in government and the private sector in fisheries, energy, and management. Victor L. (Vic) Young began his business career with the Government of Newfoundland in 1968 and became deputy minister of the Treasury Board and special advisor to the premier in 1974. He was chairman and chief executive officer of the Newfoundland and Labrador Hydro and Churchill Falls (Labrador) Corporation from 1978 to 1984, at a time when the Hydro Group was Canada’s fourth largest electric utility. Young next became chairman and chief executive officer of Fishery Products International (1984-2001), then North America’s largest vertically integrated seafood harvester and marketer. He was the executive-in-residence at the Business School at Memorial University in 2001 and he chaired the Royal Commission on Newfoundland and Labrador’s Place in Canada from 2002 to 2003. Young serves as a corporate director on the boards of directors of the Royal Bank of Canada, Imperial Oil, and McCain Foods. He is a former director of BCE, Bell-Aliant, RBC Dexia Investor Services Trust, and C-Core. 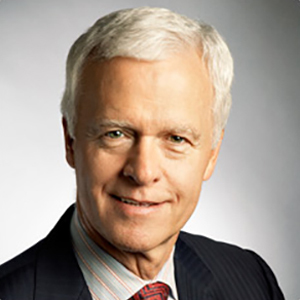 Mr. Young was appointed an Officer of the Order of Canada in 1996, and is currently the chair of the advisory committee on red tape reduction established by the Government of Canada.